A light and fresh pasta salad with lemon herb vinaigrette is the perfect pasta salad to make this summer. Pasta salad has always been one of my favourite dishes. I didn’t grow up with the mayonnaise-heavy versions you often see at weekend barbecues, but the kind my mom has always made has a delicious and tangy herbed dressing. I took inspiration from my mom’s pasta salad to create this lemony herb version. Most pasta salads hold up pretty well in the fridge for a few days, but because this recipe uses spinach, I find that it’s best within the first two of days, otherwise the spinach will begin to get a little soggy. Another option would be to leave the spinach out until just before serving, that way you completely avoid the potentially soggy spinach situation. The vinaigrette is super simple, a combination of garlic, lemon zest, lemon juice, white wine vinegar, dried oregano, dried basil and olive oil. Of course there’s salt and pepper in there too, but that’s a given. It’s so easy to go overboard with the mix-ins for pasta salad, but for this recipe I wanted to keep it relatively simple, bell peppers are a given. I love the crunch they add here. The first time I tested this recipe, I left out the red onion, but I found without the red onion, the pasta salad was missing a bit of zing. I’m a huge fan of olives, so I used some incredibly savoury and delicious Kalamata olives in here, but you could leave them out if you’re not a fan. Feta and red onion makes up the rest of our cast of characters. And of course, pasta! I love penne in pasta salad because that’s what I grew up with, but I think bowtie pasta would be super cute here as well. If you’re heading to any summer potlucks this year, this would be the perfect dish. It’s vegetarian, easy and a crowd pleaser. 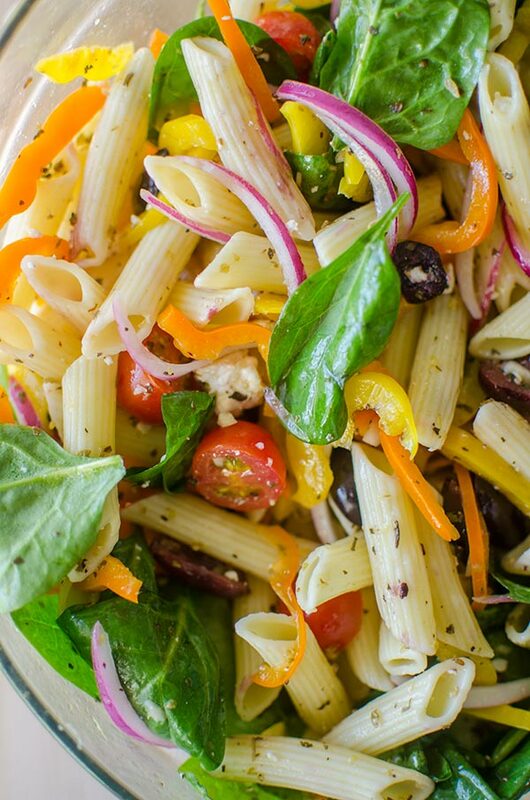 My Mediterranean pasta salad recipe is also a winner, if you want something a little different. With this being our first long weekend and the ‘unofficial’ kickoff of summer, I feel like this is the perfect recipe to get you ready for summer cooking. Simple, fresh and flavourful, just the way I like it. Cook pasta according to package directions. In a small bowl or mason jar, combine all ingredients for lemon herb vinaigrette. Once pasta is cooked, toss with dressing to avoid it clumping together. Allow pasta to cool. 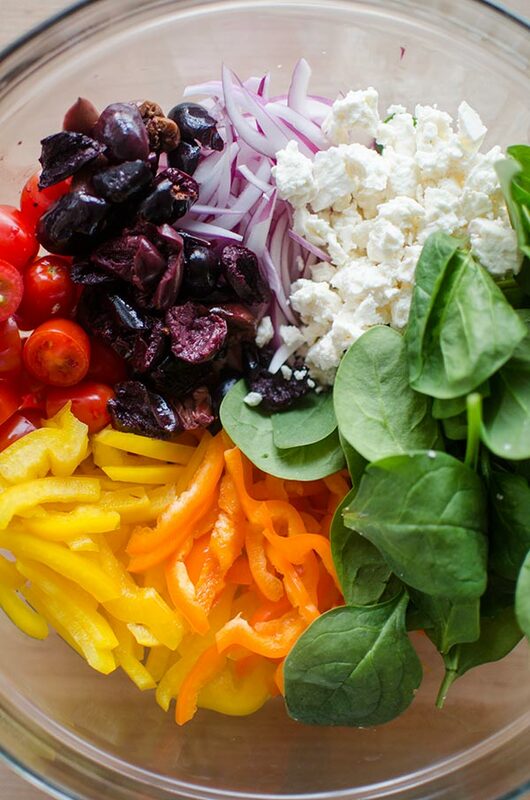 In a large bowl, combine cooled pasta with spinach, cherry tomatoes, bell peppers, feta, olives and red onion. 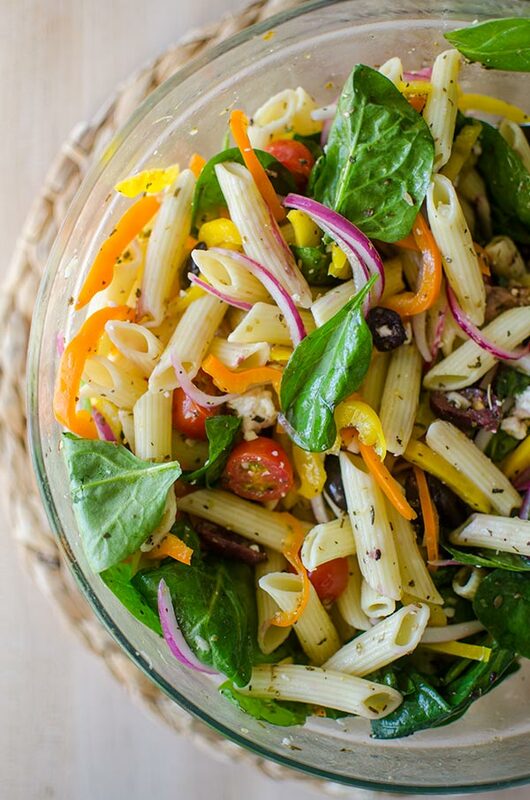 Let me know if you give this pasta salad with lemon herb vinaigrette a try in the comments below.